Left-Right motion in a "basin". It might be a good idea to join the TAS Videos IRC channel, which lets you see changes being made in real time and coordinate your work with others. Also check the ToDo section for ideas for what needs to be done, marking the item off if you're going to do it. Official site - Download game for free, manual, hint book. Only use this freeware version from Adept Software (Adam Pedersen) v1.5 - jetpak15.zip. Level pack to play with in level editor. Using this pack, you can jump directly to any level, view false blocks, play it, or even edit it. Game speed is not emulated properly in JPC-RR at current. All speeds (except the highest, which is far too fast) are speed 8. Invincibility: TAB + 2 + I For the entire duration of the current level. You're not expected to adhere to these terms 100% of the time. They're meant more as just the default option. It's always okay to spell things out fully as well. Officially the tiles are called just that, tiles, but I think when talking about solid tiles, you can also say "block". The coordinate system: (1,1) is the top left tile, (26,16) the bottom right, but negative numbers may be used for shorthand, i.e. the bottom right can be denoted (-1,-1) also. Levels should be called "[Level] 0-99" as is done in-game, or by their names of course, to avoid confusion. the RP - This (Game Resources) Page. the Discussion Thread [DT] - linked under "Game Info"
This is when you phase out a block in more than one go. Using a phasing-in block or barrier as a "stepping stone" for climbing higher or to enable a jump. Leaving down the alt key for a higher horizontal speed or lower falling speed when walking off ledges. Changing directions rapidly in order to preserve horizontal speed in a narrow shaft or otherwise. Briefly phasing horizontally to be able to drop off a ladder without jumping upward. Jetman The name is mentioned once in the hintbook. Button (Red, Blue, Cyan) R-,B-,G-button you can call it green instead of cyan. Floor Switch (Red, Blue, Cyan) R-,B-,G-switch You can call it green instead of cyan. Both enemies and Jetman toggle when they touch the switch. Barrier (Red, Blue, Cyan) R-,B-,G-barrier You can call it green instead of cyan. Moving Ladder Up/Down Ladder These look the same with the animation running in opposite directions. This makes them difficult to tell apart in screenshots. In the big .png's on the levels subpages, the end with the grey pixels indicates the direction the ladder is scrolling. In the smaller, in-editor shots it's the end that has the white pixels. Door/Exit Has to open fully for exiting the level. This takes a little while, which may affect routing. Moving Platform (Left) Conveyor The direction the stripes are leaning indicates which direction the conveyor moves. Rounded L-red/D-Red/Stone Actually has the same hitbox as non-rounded blocks. sp/f - subpixels per frame. sp/f^2 - subpixels per frame squared. How do trackbots "track" you exactly, what rules do they follow? How do the random powerups work? Found to have something to do with "busyness", also the higher the level number the more of them? How long does a stunner last? Do they stack? How long does a shield last? How does the game decide what barriers are enabled initially? I.I.R.C. it checks the provided buttons, if any. But how exactly does that go? What are the enemy speeds on conveyor belts? How long does the victory dance take? It should be checked that there's no variance here. Levels are 26 blocks wide. Levels are 16 blocks high. 1 block is 24 pixels. 1 pixel is 16 subpixels. 1 block is therefore 384 subpixels. Height of Jump is 565 subpixels. Distance of Jump is 1117 subpixels if it lasts 32 frames which is the longest possible jump on flat ground. Sometimes the Y-subpixels make the jump shorter. Jetpack up terminal speed: 64 sp/f. Fall down terminal vspeed: 64 sp/f. Fall down terminal hspeed: 20 sp/f. Jetpack terminal hspeed: 64 sp/f. Walking speed with conveyor: 60 sp/f. Walking speed against conveyor: 25 sp/f. Walking on moss: 32 sp/f. Jump initial speed up: 68 sp/f. Jump initial hspeed: 62 sp/f. In-air horizontal acceleration: 5 sp/f^2 (hspeed <=20 sp/f). 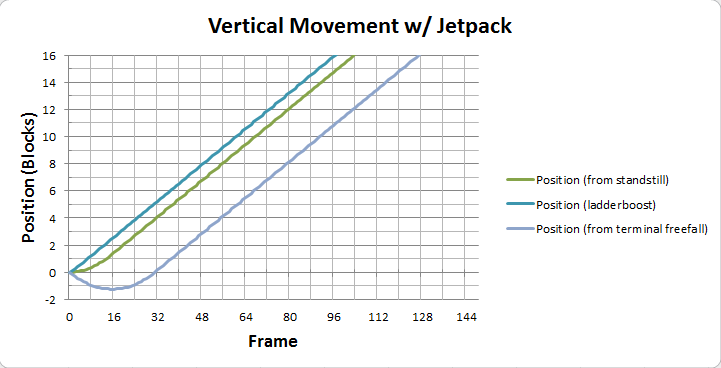 Jetpack vertical acceleration: 4 sp/f^2. 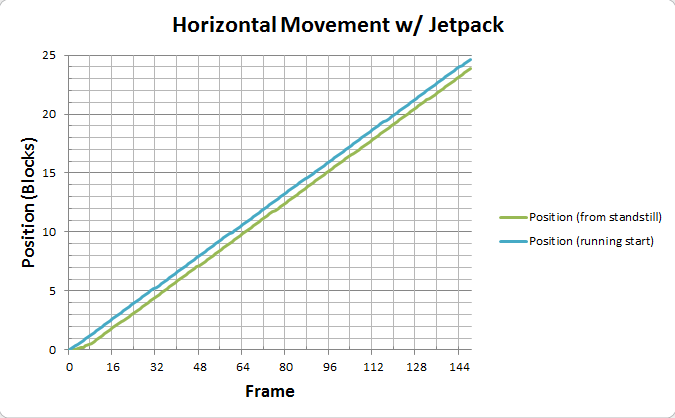 Jetpack horizontal acceleration: 6 sp/f^2. 1st frame of running jump: 55,-68 sp/f (yes, 55, not existing hspeed). 1st frame of jetpacking adds hspeed iff already moving horizontally. 1st frame of cliff runoff: 5,-64 sp/f (if holding jump, normal jump acceleration on this frame). Phasing a pink block: 5 frames. Phasing a light red brick: 26 frames. Phasing a dark red brick: 56 frames. Phasing a crate: 5 frames. Return of a pink block: 20 frames. Return of a light red brick: 94 frames. Return of a dark red brick: 226 frames. Charger recharge rate: 30 units/frame. Fuel drain drain rate: 20 units/frame. Teleporting: 20 frames in and out. Using the phaser (even if not trying to phase anything) uses RNG throws. This can be used for luck manipulation. Due to the rarity of the bonus items, it is difficult to manipulate those. However, manipulating random enemy AIs is feasible. This includes trackbots and flitzers. Any enemy affected by gravity (Trackbots and Steel Balls) has a falling speed of 64 sp/f with no acceleration (speed is achieved immediately). Any monster apart from bats and homers can activate switches that they happen upon. Trackbot Horizontal: 43 sp/f, Vertical (ladder): 33 sp/f Affected by gravity. Generally heads in your direction. It can change direction after teleporting. Makes somewhat random decisions at ladder/floor intersections - these can be manipulated through phaser usage, although some decisions cannot be changed. Being on the left/right of the bot makes it go that way at a left/right fork. Steel Ball / Marble Horizontal: 59 sp/f Affected by gravity. Reverses horizontal direction when it hits a wall. Does not fall through ladders. More about their movement in the section titled "Marble Movement". Spring Vertical: 50 sp/f Reverses vertical direction when it hits a surface. Takes 5 frames to reverse direction. Missile Horizontal and vertical: 64 sp/f Does a 90 degree clockwise turn when it hits a wall. Spikes / Spinner Horizontal and vertical: 20 sp/f Moves diagonally at all times. Bounces at a 90 degree angle when it hits a surface, and will reverse direction completely if it hits a corner perfectly. The initial direction is random and must be manipulated before the previous level's exit. Flitzer Horizontal and vertical: 11 sp/f Randomly moves in one of eight directions. Changes direction when it hits a wall, otherwise changes direction every 8 frames. Batbot Horizontal: 10 sp/f, Vertical: 17 sp/f Will head in your direction once it hits a surface, the movement is not random. Capable of moving diagonally. Cannot activate switches. Homer Horizontal and vertical: 4 sp/f Moves diagonally until it matches your x or y coordinate, then travels in a straight line at you. Can move through all blocks. Cannot activate switches. Each marble is either "fast-type" or "slow-type". Entering a teleporter can change a marble's type. If the exit teleporter is mid-air the marble becomes fast-type. Marbles move across a stretch of squares at the same speed. The type is only revealed when they collide with walls. The fast-type seems to lose less time on the turn. This is because they travel across a lesser distance before turning around due to the way the game handles subpixels and collisions. So for some marble, covering 2 squares may take 6 frames, for another, 7 frames. A "basin" is a horizontal stretch in which marbles move left and right with no teleporters. The basin's width governs how marbles behave inside it. A basin is therefore denoted by it's width, e.g. a 3-basin is three squares wide. A marble is denoted by its basin and its position inside it, e.g. 3-2 means a marble in the second (middle) position of a 3-basin. A basin can be "odd" or "even" simply based on the number of squares inside it, i.e. the 4-, 6- and 8-basins are all even. Marbles are also classified in this way, i.e. the 4-1 is odd and the 4-2 is even. In odd basins, the 2nd, 4th and last marble are fast-type. In even basins, the first 5 marbles, the last one and all the odd marbles are fast-type. A marble that falls into the basin from higher up conforms to the rules of that basin, assuming its type based on the square it fell in. Here are pictures for reference. The arrows point to the fast-type marbles. 6-basin: first 5 and the last one. The 10-basin displays all the even-basin rules. Note that each marble is independent of each other with regards to their type. Only the position within the basin in the initial situation, not their position within a "marble worm" determines the type. slamo: Here's my theory based on how I understand the game engine works...it's a small unintended consequence of the game's collision system. First a little explanation of how the game handles collisions. When an object is approaching a wall at a certain speed, the game checks whether the next frame would result in the object being inside the wall. If this is true, the direction is reversed and the new location is applied on the next frame. The game does NOT try to get the object as close to the wall as it can - if it did, the marbles would all line up perfectly forever as they would be aligned to each other and share the same subposition on the frame in which they hit a given wall. The marbles have a strange, uneven speed of 59 sp/f, yet each block is 384 subpixels, which is not a multiple of 59 (~6.51 frames to travel 1 block). This means that given two marbles that spawn next to each other and begin traveling to the left, the rightmost marble will move and not share the same subposition that the leftmost marble did when it spawned (assuming both marbles spawned in the center of their blocks). This kind of difference in subposition could result in an early or late collision with a wall - in the prior example with a wall two blocks away from the leftmost marble, the leftmost marble will trigger a collision with the wall in 6 frames (rounding down 6.51, the frames/block of marbles), yet the rightmost marble will not collide until the 13th frame! More marbles to the right would result in the 3rd one hitting at the 19th frame, 4th hitting at the 26th, 5th hitting at the 32nd, etc. We see that collisions are not happening on an even cycle - some are happening every 6th frame, and some every 7th frame, the result being some appearing out of sync with the others. I believe this is where the appearance of a speed difference is coming from, the marbles are constantly staying at a speed of 59 sp/f and the drifting is coming from slight subposition alignments as a result of the collision detection. I also want to point out that this behavior has been observed in springs as well (see level 26, Whiplash, left-hand springs). Nach: I agree with your general assessment. The speed appears constant, yet they are not in sync because they turn around differently. At 6.51, it explains why the distance to travel to be considered fast or slow is every other block. However it does not match the data presented by Svimmer above. "Every fifth marble and the last one" cannot be explain like that. So either Svimmer's data is not precise, or there is a bit more going on. According to the working theory of how 6.51 is rounded, it would also dictate that slow and fast marbles would in fact alternate as they travel between left and right barriers. Do we have data that supports that? From my experience, I see some Marbles starting to noticeably lag behind the rest of the worm, or lose its place, while the others appear to be in alignment with their relative position. Also in levels like Mission Possible, you can see on spring consistently moving faster or slower than another paired with it. 6.51 as the only basis for the speed changes does not fully explain the above occurrences. I believe there is another crucial bit of data we're missing (or at the very least, I am missing). slamo: The data certainly isn't consistent with the example I gave. Perhaps the assumption that the marbles start out in the middle of their blocks is wrong, or maybe it's something else that's more chaotic going on. The main point that I was trying to make is that it's entirely possible for this to happen within the game's engine. With springs it's important to note that they are at a completely different speed and the "6.51" example does not apply to them. Ilari: I found the memory addresses for position and velocity vectors of enemies. As far as I can tell, marbles are aligned to bottom right(!) of the block. I.e. marble starting from extreme top-left edge has xpos=384 ypos=384. I haven't checked what happens if marble teleports. And indeed, Marbles don't push against walls. Svimmer: Does anyone have any further insight into this? Spring movement also has variable speed, caused by similar factors as in case of marbles, but simpler due to fact that springs always bounce between walls and don't feel conveyors. When spring reverses direction, it pauses for 5 frames. Springs move up or down at 50sp/f. up-to-down transition is on subpixel -18...31 (TODO: Verify this). down-to-up transition is on subpixel 128...177 (TODO: Verify this). Let the spring bounce between blocks at y1 and y2, and initial position be y0. We need to solve a1 and a2 such that p0 = p1 = p2 (mod 50). Y is the initial position of the spring in "basin" (0 is topmost) and W is height of "basin". There's two kinds of jumping: a short jump is when you just jump without having pressed an arrow key beforehand (hitting it the frame after you've jumped is enough to make the jump long). You can directly clamber into a narrow corridor (1-block high) from a position above an empty square when you first enter a level. Also works if there's a teleporter exit on such a square, provided you jump before landing on the exit. Phasing up/down shifts your position to directly adjacent to the block. Pressing up/down while attached to ladders also causes you to align to the grid. Pressing left/right on ladders has the same effect if there is a block in the direction. "Phase-Climbing": You can get caught a little way inside a phasing-in block or activating barrier without it killing you. This allows you to jump off that position (either towards the side or directly upwards). May be used to climb directly upwards by phasing out a block above and jumping up a little ways inside it. There needs to be a space on the side you want to get caught on (may be created by phasing another block). Also may enable to jump further than usual by taking a mid-block position which may allow a higher and therefore longer jump than is otherwise afforded by the level architecture. Doesn't work if there's another block above the phasing-in one. Conveyor blocks may push you away if the direction they're running has an empty square. You can stand still on a conveyor belt or on ice by phasing up or down. "alt-dropping": By keeping Alt held after jumping, you can gain significant horizontal distance when falling off edges at the cost of no height and no instant vertical terminal velocity. There's two kinds of alt-dropping: it depends on whether you did an short or long jump for the pre-alting. If you land on a conveyer while keeping this activated, you'll have a normal walking speed of 55 sp/f regardless of belt direction. This is an improvement if walking against the conveyer but a slight downgrade if walking with it. It is possible to jump out of a hole in the wall and still gain height (see upper left corner of level 28). The jump is subpixel dependent; use phasing up or down to do slight repositioning. "wiggling": Your horizontal direction while jumping can be instantly reversed. Doing this follows the same velocity curve and the direction can be reversed multiple times. This can be used to "wiggle" up or down one-block shafts to maintain horizontal velocity. SvimmerI asked henke37 (who added the above trick here) what he meant and how to do this, but he couldn't provide any evidence so this might well be a troll. I tried every single key on my keyboard, and unless it's a matter of having the right kind of keyboard as well (? ), no jump key behaves any different from the others in this respect. If it's a troll, it's not even added on April the 1st, and is in pretty bad tastes. You can phase a block while jumping off it. Works with any phasable block so long as you were close enough to phasing them through. You can "delay-phase" blocks. You do this by starting to phase a block, moving away from it and returning back to phase it through all the while never letting go of the phase button. You may also never start phasing any other block or the timer is reset. You can hit buttons and activate switches. You can jump, climb ladders and fly. Allows phasing blocks with no "scaffold" block underneath by repeatedly jump-phasing them. You can phase a block you're caught inside, either horizontally, or downwards if you're near the top edge. You can just horizontally phase in one jump a lred block that you can't reach without jumping. "pre-phasing": It can be useful to phase out a block before actually meaning to pass through it (for monster manipulation or whatever reason). Holding down while flying decelerates your vertical speed down to zero. Phasing left/right while flying aligns you to the grid at a speed of 32 sp/f even if there is no block. You can use this to mitigate horizontal velocity loss if you need to lose height. Holding up or down while phasing and flying left or right cancels this effect. Left and right take priority in terms of the phasing direction. If you're falling at terminal velocity and need to go back up, this alignment can be used for rapid upward acceleration. Start flying and phase for 1 frame after passing a block's midpoint (hold left or right to ensure vertical alignment) - this will instantly reverse your velocity and allow you to reach upward terminal velocity much quicker. Phasing up/down shifts aligns you to the grid and stops your horizontal movement. You can climb a ladder for a frame to get to full vertical speed faster. Optimum pattern for jumping up ladders without fuel: climb for 1 frame, jump for 3 frames, repeat (compensate for lag frames). This results in an average vertical speed of 61 sp/f. You can keep holding alt after jumping to be able to fall down ladder chutes as if there was no ladder there. Effect only stops when alt is released. By pressing alt down directly underneath a block, you avoid having to actually jump. "instant drop-off": If you're already on a ladder, you can phase briefly towards the side (if there's a block there) and press the jump button to fall down directly. You can phase left or right to stay still when on autoladders. Climbing up a uladder has the same terminal velocity as flying; use this to conserve fuel. Due to the first few frames of jumping having a higher velocity than walking, it is slightly faster to use a jumping pattern through columns of adjacent ladders. While holding left or right, hold Alt for 4 frames (do not ignore lag frames, compensate), release Alt for 1 frame, repeat. This allows you to maintain an average velocity of 58 sp/f, an improvement over the walking speed of 55 sp/f. When climbing down uladders, phase to the left or right when above the midpoint of an adjacent block as the correction speed is higher than the climbing speed. You cannot jump off the top of a dladder like you could off a uladder or regular one. The following jumps are extreme cases of what is possible to perform. Some of them are easier if you get a running start, i.e. there is more than one block for acceleration (even though there is no acceleration for running). The format (X,Y) has distance covered horizontally and vertically in blocks (positive values are rising onto higher ground). Onto a ladder means being able to grab a ladder in the square indicated. Onto a platform means being able to land on a platform in the square indicated. Enemies always teleport when hitting a TP except during their tele-exit cooldown. The cooldown stops them from entering a TP directly next to one they just arrived at. You can turn a monster around (90 degrees with missiles, 180 with marbles and springs(? by catching them inside barriers. Which side of the barrier it was caught determines which way it's left facing. You are able to pick up items underneath monsters in some cases (e.g. in the same square as a spring) but this requires subpixels to align. After dying you can still finish the level by landing at/lifting to the door. If you land on ice after dying, or just die on ice, you will continue to move at full walking speed in whatever direction your body was traveling. This can be used to cover very large distances post-mortem and get seemingly impossible death exits. You are invulnerable during teleportation. There is however a period of vulnerability in-between two teleports even if you never let go of "down". Items may be collected during teleporting and buttons and switches are also operable. You can teleport while still around half-a-block in the air. This prevents you from dying to monsters such as marbles on the teleporter square. Teleporters may teleport to the wrong color if the level has too many of them. Unfortunately, there doesn't seem to be enough teleporters in any of the levels for this to happen. Passing through a teleporter resets your velocity. You still keep your "jumping" status, that is whether you fall as if from jumping or from just falling off a ledge. Teleport destinations are randomly chosen if there is more than one possibility. This applies to both you and enemies and it can be luck manipulated by phasing. A convex corner of spikes with no solid block underneath can be clipped through at a precise position (See level 33 - Donkey Pack, bottom left). Picking up a fuel tank while falling resets your vertical speed to zero. It is more fuel efficient to fly through fuel drainers than it is to walk through them. Jumping when 2 blocks under floor spikes ( ) is survivable, despite the obvious appearance of a collision. This section is useful to have so multiple people don't end up doing the same work. Just add it here and it will get done, as if by magic! :) Add your name below if you want to express you're going to do one of these to avoid overlapping work. Different route strategies. Add .png's (and videos?) for each. currently only missing the links to the spot in the ready TAS where each of the levels without separate WIP uploads are played. Fill in new data as it is collected. Can we find out more about trackbots for instance? Adding more information about running the game in JPC-RR. Possibly even the hd image itself, what DOS was used (where it's found), a link to a subpage containing all the WIPs and possible lua scripts, memory locations etc. Filling out the jumping table/getting rid of it completely. Adding in technical details in the tricks section, i.e. how long do you have to hold ctrl for the instant drop-off trick to work. Modified Jetpack Script - Ilari's script modified to show a placeholder character for levels with hidden passages. Grid of Guides - was useful for "extracting" images of single tiles. Draw arrow - not a standard feature of GIMP as of yet.